Last time I didn't mention the exact brand of multivitamin I'm taking but for this post I think it's important to know, in case you want to compare your results to mine. However, first I want to make it clear, this post is not sponsored by the brand at all. It's straight up me telling you my thoughts with no one paying me to say nice things. 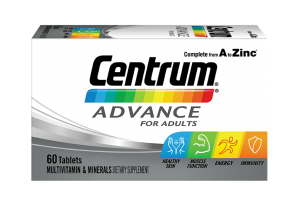 Centrum Advance for Adults, which comes in a 60 tablet bottle, is what I settled on in choosing a multivitamin. It's a leading brand, and I will say that seeing ads for it constantly during a TV show I've been following, telling me how it can boost your energy levels, probably influenced my decision to try it. I'm not a doctor, or a diet supplement specialist and, as I said, I've never taken multivitamins before, so I have nothing to compare them too, or know anything about whether ingredients in them actually are beneficial. For example, I've no idea what Lycopene is, but it's listed as an ingredient so it must be good, right? (I've linked the ingredient to it's Wikipedia page so you know I can Google things too, I just never bothered until now). For the purpose of this post, I think it's best to list the four main things (on the product box) Centrum claim their multivitamin assists with and I'll tell you if I feel it has. For the record I haven't changed my diet (which is reasonably healthy food and very little junk food) or done any more or less exercise than prior to taking multivitamins (I usually go 16km a day on an orbital walker 5 times a week and walk the dog for an hour a day seven days a week - plus any skateboarding I do). Healthy Skin is the first claim. I can't definitively say my skin feels healthier. Prior to multivitamins my skin occasionally gots itchy and I got the odd pimple here and there, particularly on my face. I shower every day, so, at best, maybe my skin hasn't been itchy as much but otherwise I can't really tell on this one. Improve Muscle Function is next on the list. From my point of view I was hoping this would help prevent muscle injuries just from general, fast, movements whilst skateboarding - things like using your arms to maintain balance, that kind of thing, as opposed to impact related injuries. I can't definitively say multivitamins have improved my muscle function. Maybe I've thrown my shoulder and back out a little less whilst skateboarding, but I've also been more careful to warm up and stretch before skating too. It could be that making the difference. Energy. This is the big one that Centrum focus on in their ads. 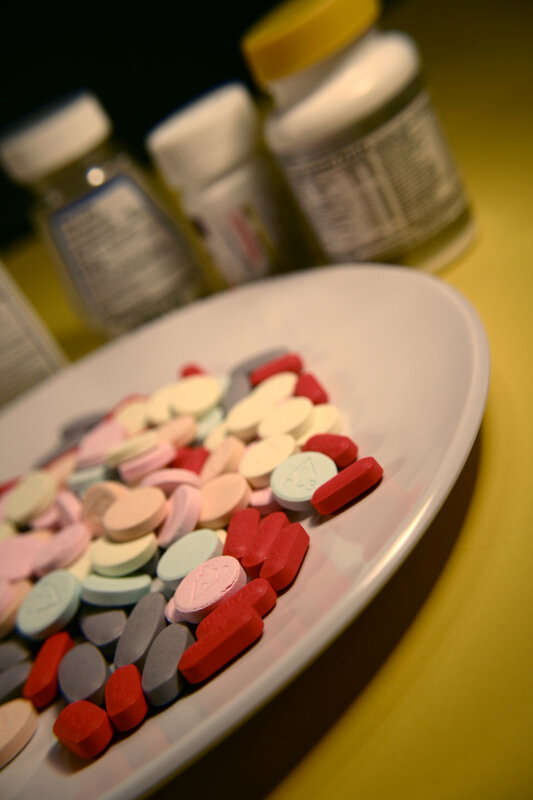 Taking a multivitamin tablet once a day is supposed to boost your energy levels. I can't say I've noticed any difference in my energy levels. I get up early, start work as usual, have breakfast, exercise on my orbital walker, work a bit more, have lunch whilst watching TV... and crash into sleep missing the end of my show. Just like always. Take the dog for a walk, back into work or skateboarding, have dinner, watch more TV, back to work, crash into bed just after midnight, sometimes later. Honestly, no difference in this area. The final, key area is Immunity. Potentially I'd say it's had some effect here. Around this time of year I tend to get a lot of colds, sometimes really bad ones. For the most part I've been pretty healthy. Not one hundred percent healthy. Still getting a few minor sinus problems and troublesome coughs but nothing like full blown colds that I usually end up with. Beyond those four areas I can tell you it has completely disrupted my digestive system to either being more normal or just being different to what it was. I'm not going into detail here because you don't need to read an in depth account of me doing number twos to a different schedule, just know multivitamins definitely had an effect in that department. Has it all been worth it? I'm not really sure? My plan from here, after I've taken my last two tablets, is to stop taking any kind of multivitamin and see if I can notice a difference. Essentially, do I feel better taking them, or are the benefits so minimal I may as well not bother. Maybe that'll be next. If I decide to buy another bottle, or try a different multivitamin brand, I'll revisit this topic again with another blog post. If not. You won't read about it again. Since my heart attack I have been wondering about the multivitamins also. The doctors told me my vitamins C levels were very low, along with a few others. I know that smoking was a big cause of my vitamin C levels being so low. It has been about 3 and half months of no smoking now and my VC levels have increased with the aid of taking a VC tablet every day. They told me it would help me to not get colds so often. Well, I have had a cold for the last 2 weeks. I do believe vitamins work though. Many years ago I got a planters wart on the bottom of my foot. The doctor told me I had to cut it out. No other option. It took 22 stitches and 2 months to heal. Only one month later it came back! I went to a new doctor and he said I was my vitamin C levels were very low and that is what was causing it. I didn't believe him at all. I went to two other doctors and they both said I needed a second surgery. I decided to try the vitamins before getting cut up again. Well, it worked! The planters wart went totally away like it never existed. It has never come back either. I don't think vitamins work for everything but for some things they are awesome. That's great to hear the vitamins had a definite effect on something so specific. I'm still skeptical that multi-vitamins can do everything that the manufacturers claim but I have started taking multi-vitamins again after a month break. They definitely have a positive effect on my digestive system that helps me feel better over all. I'm not so sure about all the other things they're supposed to help with though.